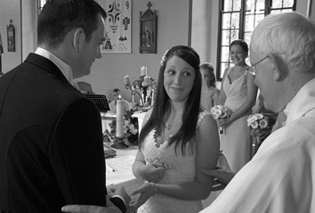 Wedding Videographer – Catriona and Paul – 20’th July 2013. 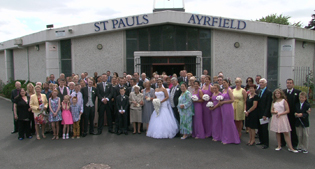 I was the official wedding videographer on another lovely day for the wedding of Catriona O’ Connor and Paul Phelan on 20’th July 2013. I started filming at Catriona’s house were the girls and flowergirls were having the last minute finishing touches done by Sian Sharkey hairstylist. I left the house and headed to St. Fintan’s Church Ballyfin were I had a quick chat with Paul and the lads. 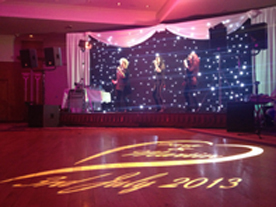 The wedding flowers were magnificent and done by the team at All Occasions Florist in Portlaoise. The church was just magnificently decorated with lovely candles and other incidentals, they were stunning and done by Caroline from A Wedding by Caroline. The priest on the day was Fr. Joe Brophy who was lovely and a joy to work with, the church singer was fabulous and a good friend called Grace O’ Connell. Catriona arrived to the church in style, she was in her fathers pride and joy an old Wolseley. Catriona and Paul enjoyed an ice cream from the ice cream van outside, a nice way to cool down in the heat. Afterwards we went to the Clanard Court Hotel for the wedding reception were Adam and the team were there to look after everything for the day. They had the wedding band Pink Champagne who is one of the most sought after wedding bands around. 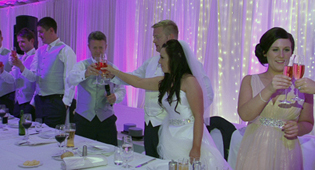 It was a great day and I look forward to seeing Catriona and Paul when their wedding DVD’s are ready. 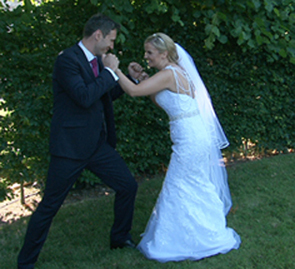 Wedding Videographer – Laura and Chris – 19’th July 2013. 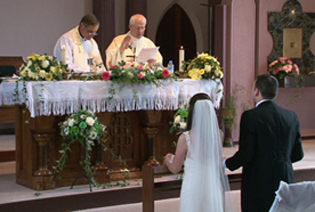 I had the honour of been the official wedding videographer at the wedding of Laura Daly and Chris Fields on 19’th July 2013. I started filming at Laura’s house in Drumcondra were all was calm and everyone was relaxed and looking forward to the great day ahead. I headed to the church of St Vincent de Paul in Marino were I met Chris and the lads who were hard to spot among the 250 guests who were attending the wedding. Laura arrived in a beautiful silver Beauford car by ATT Cars. The church was magnificently decorated and the priest on the day, Fr John Aikoye was so nice and was a joy to work along side. The Appassionata String Quartet were fantastic and really added to the ceremony. 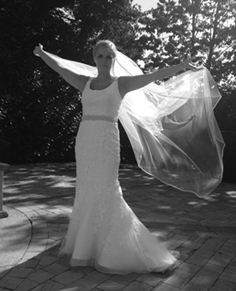 The wedding photographer was Carol O’ Brien Duncian who was a joy to work with. 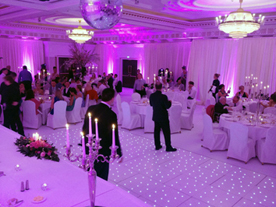 We headed to the stunning Killashee House Hotel for the wedding reception, were as always everyone was looked after great. The wedding band was the Firm who had the crowd on their feet for the night. I look forward to meeting Laura and Chris when their wedding DVD’s are ready. 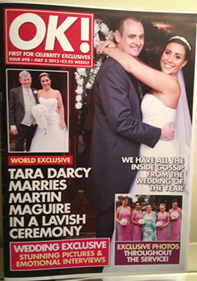 I had the pleasure of been the official wedding videographer for Tara Darcy and Martin Maguire on 3’rd July 2013. I started filming at Tara’s house in Cappagh Ave in Finglas, it was a full house with many of the neighbours in to wish Tara all the best, after all the fun in the house I proceeded to the church of St Paul’s in Ayrfield were I met Martin and the lads who were meeting all the guests. 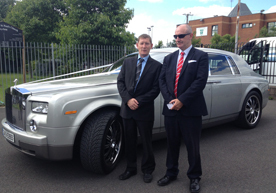 Tara arrived in a stunning Silver Rolls Royce Phantom from Absolute Limos and if you know your cars it’s a 6 litre, I’m glad I don’t have to pay the road tax on that ha ha.. It is possibly one of the nicest newer cars around the lads had a stretched limo, the car was driven by Mick Massey who is well loved in the trade for his sense of humour. 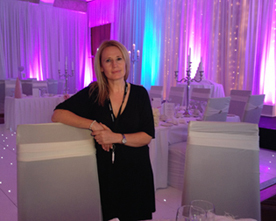 The wedding photographer was Paddy Burke from Burke Photography who did a great job. 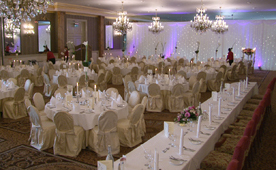 We headed off to the wedding reception in Knightsbrook Hotel were Caroline and the GM Patrick were there to meet and greet them and look after everyone for the day. The wedding band were Who’s Eddie who are a great band and so professional they just rocked the house. 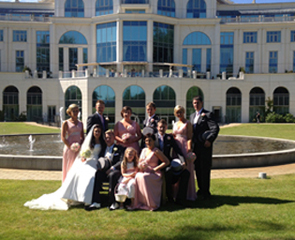 It was a great day and I look forward to talking to Tara and Martin when their wedding DVD’s are ready. 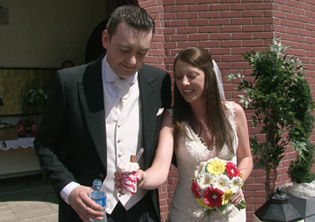 Wedding Videographer – Aoife and Aaron – 6’th July 2013. 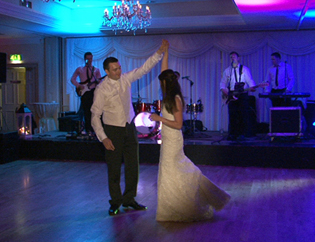 I had the pleasure of been the official wedding videographer at the wedding of Aaron Massey and Aoife Byrne on 6’th July 2013, this was the wedding of the year so far. I started filming at Aoife’s house were everyone was getting ready and there was great banter going on in house. I proceeded then to St Mary’s Church in Enniskerry were I met Aaron and the lads. They decided that it was such a glorious day that they would head to the Old Forge Pub for a quick pint. The church and hotel were magnificently decorated by Linda Flanagan from Atmosphere Displays who’s work is second to none. I have had the pleasure of working with her many times including the most famous wedding of all Mr. Michael O’ Leary and Anita. The priest on the day was so helpful and was a joy to work along side we also had the Dublin Gospel Choir who added to the already fantastic atmosphere in the church. We headed to the wedding reception in the Ritz Carlton Hotel were we were treated like royalty, but it is the Ritz so attention to detail is second to none. The wedding photographer was award winning photographer John Ryan, while the formal photos were been done on the lawn everyone was entertained by none other then Conor Mc Keown who did a fabulous job as he always does. The wedding band was the Infamous band Spring Brake, who entertained the wedding guests for the night. 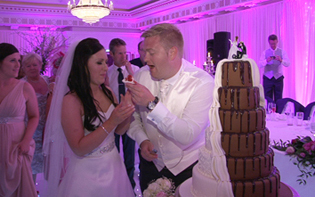 It was a great day and I look forward to talking to Aoife and Aaron when their wedding DVD’s are ready.